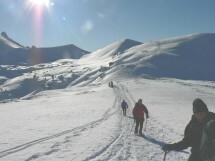 I organizes a winter hike on the head of the Sallaz. Nancy-sur-Cluses (58 km from Geneva) this Sunday, January 15th. A gradual rise in the forest and with a panoramic view throughout the day. The summit at 2026 m.
A gradient of 800 m and a distance of 11 km. A gradient of 800 m and a distance of 11 km. Walking time: about 5 hours.